Oscar Florianus Bluemner (American, born in Germany, 1867-1938). 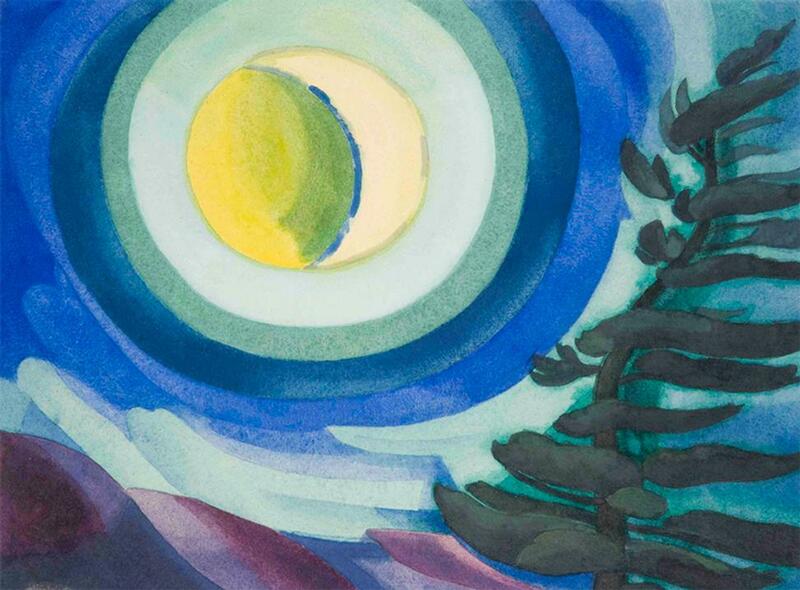 Moon Radiance, 1927. Watercolor with gum coating on hot pressed off-white wove paper laid down by the artist to thick wood panel. Collection of Karen and Kevin Kennedy. 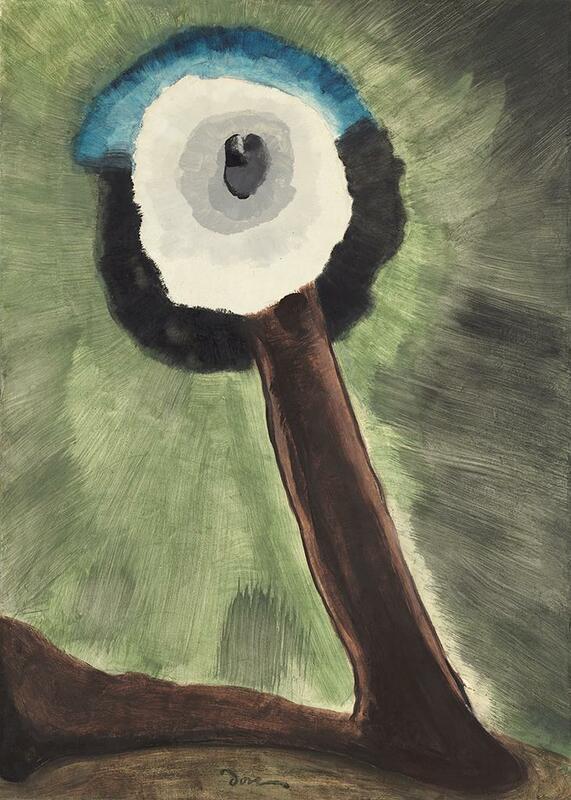 Arthur Dove (American, 1880-1946). Moon, 1935. Oil on canvas. Collection of the National Gallery of Art, Washington, DC. Gift of Barney A. Ebsworth, 2000.39.1. George Inness (American, 1825-1894). 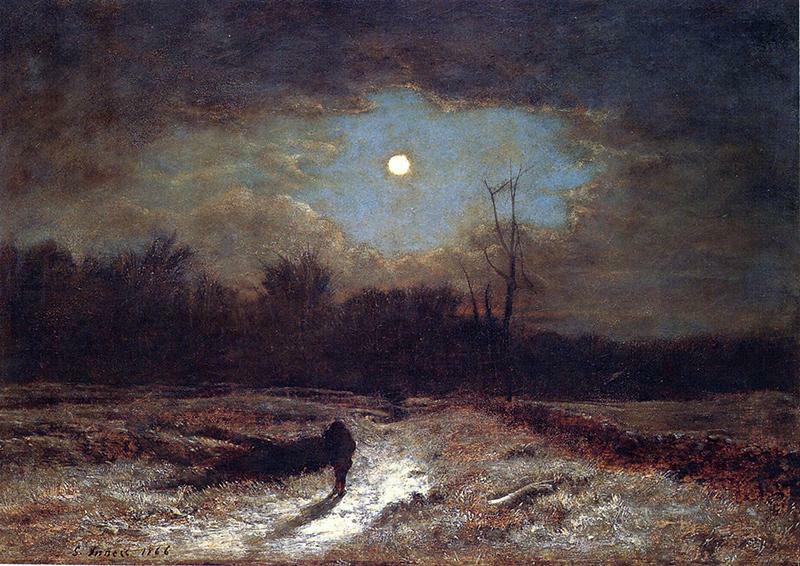 Winter Moonlight (Christmas Eve), 1866. Oil on canvas. Collection of the Montclair Art Museum. Museum purchase; Lang Acquisition Fund, 1948.29. Next winter, the Hudson River Museum, in Yonkers, New York, presents a stunning exhibition devoted to the allure of the moon for American painters, whose art has reflected the eternal fascination with our closest celestial body. It is the first major museum examination of the moon as it relates to the story of the American nocturne, as it developed from the early 1820s through the late 1960s. Frederic Edwin Church, Moonrise (The Rising Moon), January – March, 1865. Oil on canvas, 10 x 17 inches. The exhibition features more than 50 works of art, highlighting key painters who depicted the moon, from the early 19th-century masterpieces of Thomas Cole, the father of the Hudson River School, who embraced a kind of longing Romanticism that the astronomical body symbolized, to late works by famed illustrator Norman Rockwell, represented by his depictions of a long-held romantic yearning finally fulfilled–America’s triumphant lunar landing in 1969. All of the works in the exhibition underscore how the Romantic idea of the moon held an inexorable pull for artists, and was central to its depiction of landscape, a subject of ongoing engagement at the Museum. The Color of the Moon will premiere at the Hudson River Museum on February 8, 2019 and run through May 12, followed by a summer 2019 showing at the James A. Michener Art Museum in Doylestown, Pennsylvania, which has partnered with the Hudson River Museum to organize the exhibition. The Color of the Moon reveals the long and enduring relationship between art and lunar science.The exhibition coincides with the 50th anniversary of the Apollo 11 mission, when American astronauts traveled across the skies to step onto the pitted surface of the moon in July 1969. Even before that historic moment, much scientific and aesthetic debate revolved around the question: What color is the moon? Artists continued their own explorations despite public disappointment when astronauts reported the rocks and dust were grayish brown. The Hudson River Museum, which has the only public planetarium in Westchester County and is dedicated to exploring the relationship between the arts and science, is poised as an ideal venue to explore this subject. 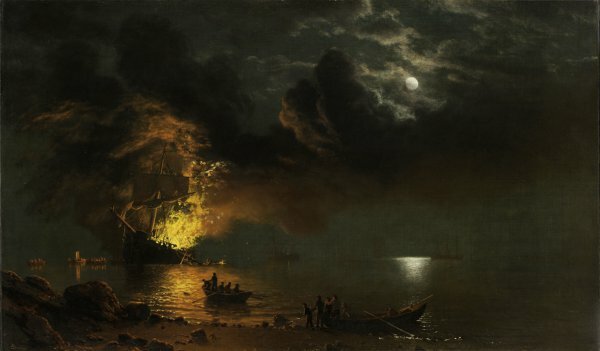 The Burning Ship by Albert Bierstadt. Other major artists represented through loans include Jasper Francis Cropsey, Frederic Church, Albert Bierstadt, Susie M. Barstow, George Inness, Edward Bannister, Ralph Blakelock, Winslow Homer, Childe Hassam, Arthur Dove, Edward Steichen, Oscar Bluemner, Marguerite Zorach, Joseph Cornell, and Jamie Wyeth. Major lenders include the National Gallery of Art, Smithsonian American Art Museum, The New-York Historical Society, Cooper Hewitt, Smithsonian Design Museum, Yale University Art Gallery, Olana State Historic Site, Pennsylvania Academy of the Fine Arts, the Delaware Art Museum, the Virginia Museum of Fine Arts, and Francis Lehman Loeb Art Center at Vassar College, along with works from private collections. The Hudson River Museum will co-publish a fully-illustrated, 200-page catalog with Fordham University Pressand the Michener Art Museum. Authors include co-curators Laura Vookles (Chair, Curatorial Department, Hudson River Museum) and Bartholomew F. Bland (Executive Director, Lehman College Art Gallery, The City University of New York), as well as Theodore W. Barrow (Assistant Curator, Hudson River Museum), Stella Paul (author of Chromaphilia: The Story of Color in Art), and Melissa Martens Yaverbaum (Executive Director, Council of American Jewish Museums). 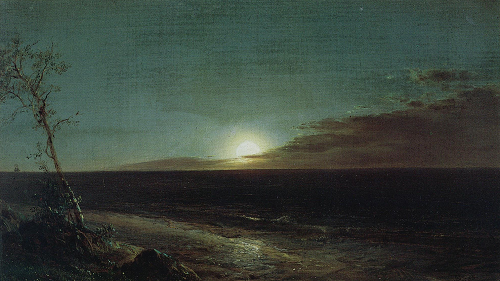 Themes explored in the essays will include our eternal fascination with the appearance of the moon and the myths it inspired; the moonlit landscapes of the Hudson River School; the moody moon of the Gilded Age; the allure of our lunar neighbor for early Modernists; and how the race for the moon transformed its appearance in popular culture.